Congratulations… you’ve wound thread on your first bobbin! Now it’s time to insert the bobbin in your sewing machine. 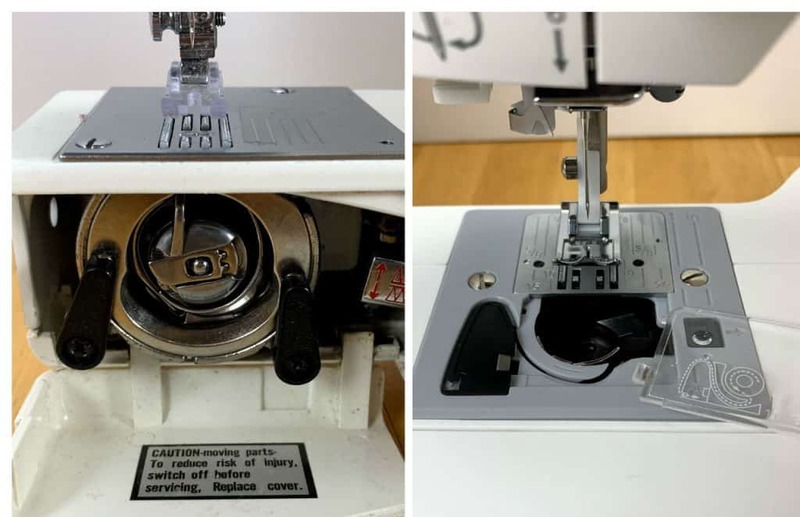 Because there are so many different sewing machines, it’s impossible to share with you specific details about how to insert the bobbin on your make and model of machine. 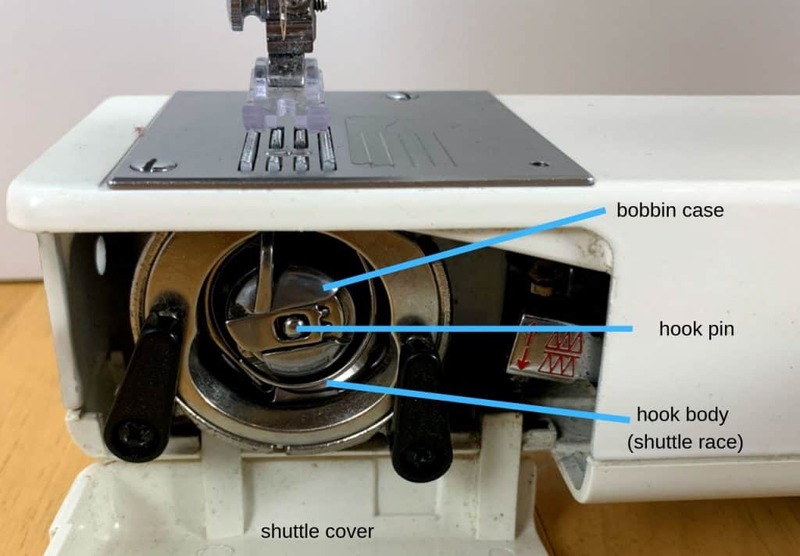 The details provided in this post, though not specific to your sewing machine, will help you focus on the information you need so you can get the bobbin inserted correctly. IMPORTANT: Bobbins aren’t one-size-fits-all. They’re not universal. This means every sewing machine requires a specific type of bobbin. You need to make sure the bobbin you are using was made for your machine. Otherwise, your stitches won’t come out right and sewing won’t be any fun. The metal bobbins are for my Elnita. The bobbins in the clear container go in the Pfaff I borrowed from my mom. The bobbin on top of the spool of thread is the one I wound for my Singer. What Part does a Bobbin Play in Making Stitches? As the needle moves up and down in the fabric, thread from the bobbin and thread from the top spool come together and stitches are formed. Make sure you have a bobbin with light colored thread. Most machines either have a front-loading bobbin or a top-loading bobbin. 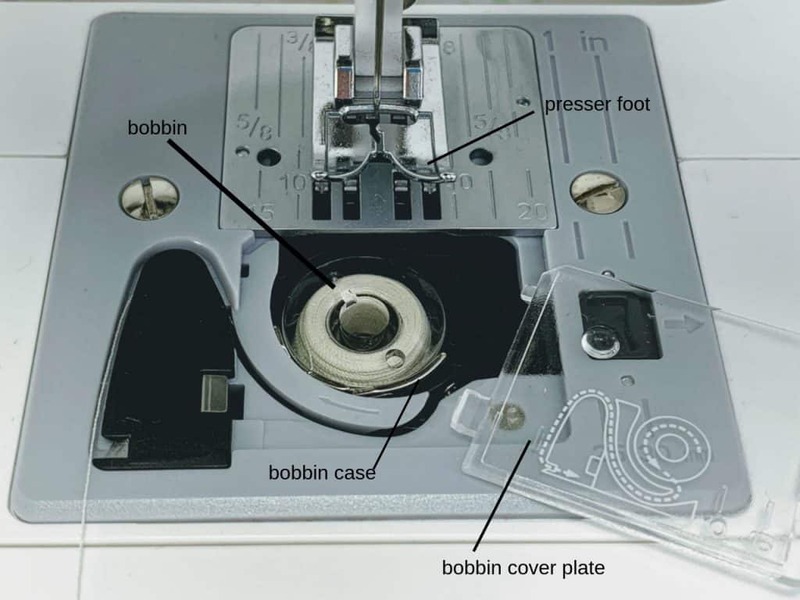 If you can’t tell by looking at your sewing machine, refer to the instruction manual and/or quick start guide for details on the bobbin system your sewing machine uses. Then read the section below that corresponds to your sewing machine. Open the sewing machine instructional manual so you’re looking at the illustration(s) or the photograph(s) where the main parts of your sewing machine are labeled. The bobbin case sits behind the shuttle cover in a piece called a hook body or shuttle race. Look at the directions provided in the instruction manual for your sewing machine for the exact steps to insert the front-loading bobbin. Most machines will use or have a variation of the following steps to insert the bobbin in the front of a machine. Open the cover below the needle plate so you can see the bobbin case. Lift the lever on the bobbin case and remove it from the sewing machine. Leave a tail of about 3 to 4 inches of thread and place the bobbin in the bobbin case. Important: There is a certain way the bobbin must be set in its case. 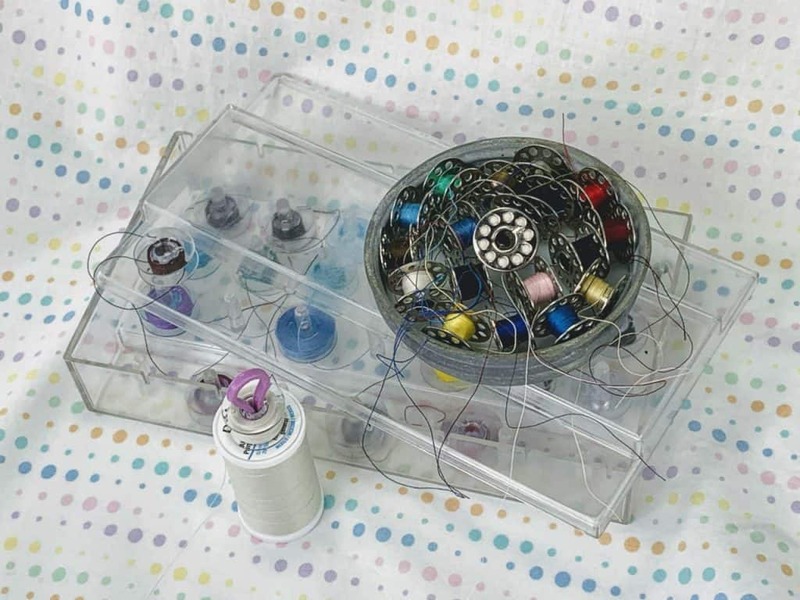 In addition, there will be at least a couple of slots in the bobbin case you’ll need to draw the thread through. Once you’ve done this, you’ll need to pull gently on the thread and see if the bobbin spins in the direction as explained in the manual for your sewing machine. For my machines with front-loading bobbin cases, the bobbins must turn clockwise. I can’t say for sure what direction it needs to be on your machine. If the bobbin isn’t turning in the direction described in your instruction manual, remove it from the case, flip the bobbin over, and try again. Hold the lever of the bobbin case and slide it onto the hook pin. (This is the post in the middle of the hook body.) Let go of the lever and press it securely in place. Note: Refer to the instruction manual so you know what side of the bobbin case should be facing upward. Leave the shuttle cover open until you thread the top thread and draw up the bobbin thread from the bottom. Open the instruction manual that goes with your machine so you are looking at the illustration(s) or the photograph(s) where the main parts of your sewing machine are labeled. Top-loading bobbins do NOT have a separate bobbin case. The bobbin case is in the sewing machine. Refer to the specific directions in the instruction manual for inserting the bobbin in your machine. Make sure the needle* is in its highest position by using the handwheel. Remove the bobbin cover plate. Place the bobbin in the bobbin case with the thread running in a specific direction. Note: My machine requires the bobbin thread to be in a counterclockwise direction. Check your instruction manual for the details on your machine. Pull the bobbin thread through the thread channels as described in the instruction manual. Leave a 4-5 inch tail. Replace the bobbin cover plate. *Note: The needle is very sharp. Be careful as you insert the bobbin. You have foundational knowledge about a sewing machine bobbin. The purpose and the role the bobbin plays in making stitches makes sense to you. Only use bobbins made specifically for your sewing machine and pay attention when winding the bobbin so it is done correctly. If not, you will have problems with the stitches. After following the directions in the instruction manual for your sewing machine, you know the bobbin is inserted correctly. 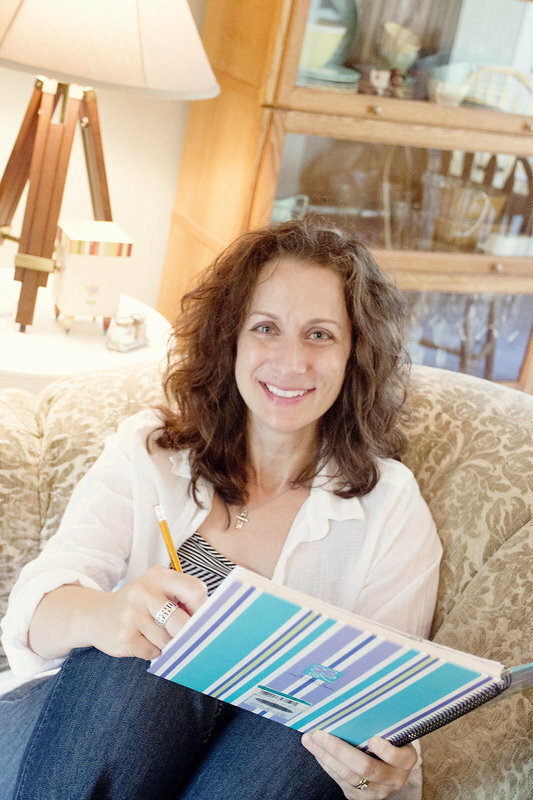 What happens when you have a bobbin full of thread in your sewing machine? It’s time to learn how to get the top spool threaded!